The North Plains Senior Plaza provides affordable housing to the population of 55 years of age and up who are looking for independent-living, one-bedroom apartments. The 33-unit, 3-story apartment complex is clean and secure. The elevator makes all floors easily accessible. 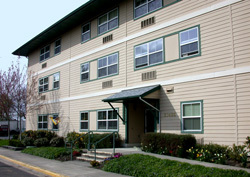 These quiet and affordable apartment homes are located in the heart of rural North Plains, Oregon. We are just minutes away from major arterials leading to the heart of Portland, the majestic Cascade Mountains, Oregon’s wine country and the Pacific Coast. The City of North Plains is on the north side of Oregon State Highway 26 (Sunset Highway) at the Glencoe Road Exit #57. The MAX (Metro Area Xpress) has several stations located just six miles away in Hillsboro.